Alice Agogino is a mechanical engineering professor at the University of California at Berkeley, and she and her lab are among a group of engineers that are designing what might be the next generation of space exploring robots. These don’t look like the Mars rovers with the big wheels that you may be thinking of– oh no, they are totally different– and that’s the point. These robots actually look like a ball of rods and cables, and they are modelled after a baby toy, of all things. It all began when Vytas SunSpiral, a robotics researcher and his colleague Adrian Agogino (Alice Agogino’s son and also a robotics researcher) were brainstorming how to improve space robotics. They happened to be playing with a baby toy called a Skwish. The skwish is a type of structure known as a tensegrity structure. In tensegrity structures, rigid parts like wooden rods or steel beams aren’t directly connected to one another by nails or screws, but rather are held together by wires, cables, chains or some kind of band. As a baby toy they are fun to play with because you can squash them and throw them and they won’t break. They can easily distribute and absorb forces that result from impact. So after throwing this toy on the ground and observing its ability to remain intact, SunSpiral’s team realized this type of structure might be a good landing structure for a space robot. Traditional space robots, like the Mars rovers are really difficult to land because you have a pretty delicate robot approaching a planet at really high speeds. As a result, engineers spend a lot of time and money making sure nothing breaks during landing. In fact, landing Curiosity, the current robot on Mars, has been nicknamed the 7 minutes of terror. Traditional rovers are also somewhat limited in the places they can explore. For example, rock walls or cliff edges are too risky for them. If one were to fall down a steep slope then it could break rendering the rover useless. Sharp rocky surfaces can also tear or puncture the robot’s wheels making it difficult to move. Robots based on tensegrity structures might be easier to land and cheaper to make. They could possibly even explore some of the more challenging surfaces. “So tensegrity rovers offer a lot of advantages over the traditional wheeled-structured rovers. They’re lighter weight, they’re more robust, they can handle lot of damage because the load is distributed among the tensile elements,” explains Alice Agogino. SunSpiral and his colleagues have received a NASA Innovative Advanced Concepts award to see if they can get these structures to move and perform the tasks that are needed for space exploration. 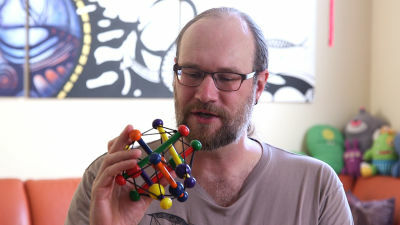 He is now a principal investigator of the Dynamic Tensegrity Robotics Lab at NASA Ames Research Center, and several collaborators, like Agogino’s lab at Berkeley have joined the research. “How science really happens is that you get teams together, you build collaborations, you build networks of colleagues who are thinking about similar parts of the problem but may be taking slightly different approaches to it… and you work with each other and you share ideas,” adds SunSpiral. There’s a lot involved in designing one of these robots. In general, computers control motors that cause the cables to stretch or compress. This causes the structure to shift its shape, altering the center of gravity and creating a rolling motion. The eventual idea is that these robots could carry instruments, like cameras and sensors. Several robots could be compactly packed into a space craft and dropped on a planet where they could roll around taking images and gathering data. 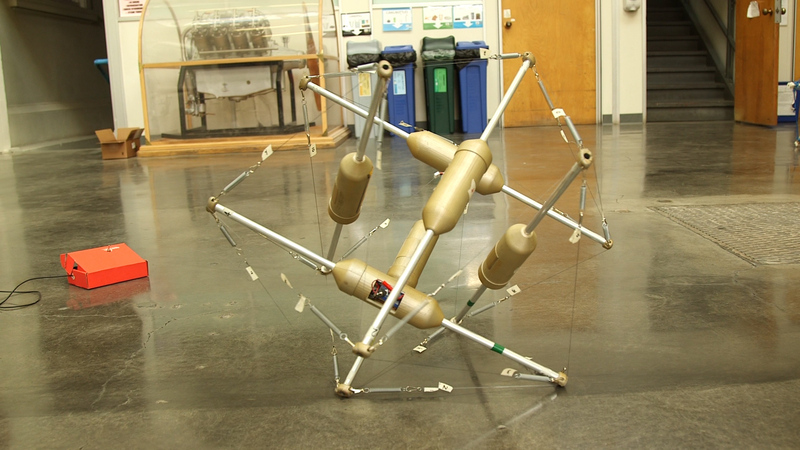 One of the tensegrity robot prototypes developed at Alice Agogino’s lab. This one has a centralized computer and uses linear actuators to expand and compress the cables to get the robots to move. 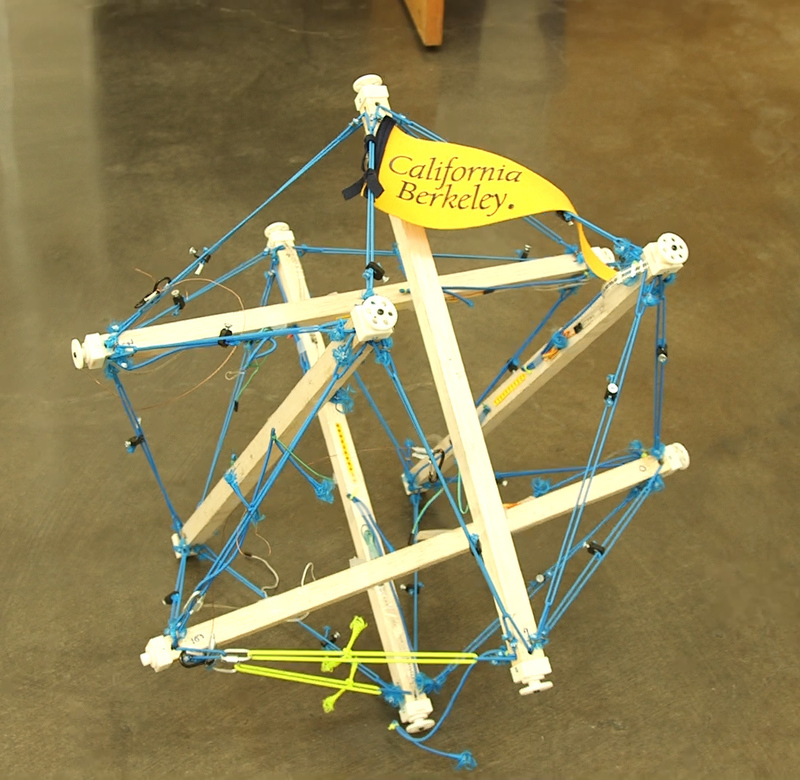 Agogino’s lab at Berkeley has created several rapid prototypes of the tensegrity structures. For each prototype they change parameters like the materials they are making the robots out of and the types and locations of the motors. For example, one version uses motors that stretches and compresses the cables by pulling or pushing on a straight line, while another version actually wraps the cable around a spool to shorten it. 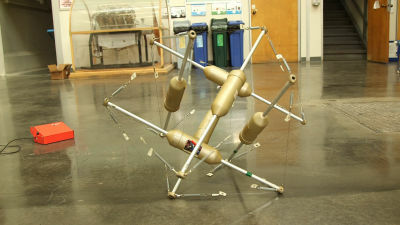 This is the most recent tensegrity robot prototype created by Alice Agogino’s lab. The computers and motors that control movement are located in the pods. Once the prototypes are built they test for things like how fast they go, how much energy they need to move, how much weight they can carry, how far they can be dropped, and how they respond to different environments. In additional to building physical prototypes, the teams are also exploring how to best program the robots to move using NASA’s Tensegrity Robotics Toolkit (NTRT). They also use computer simulations to build computer models of these robots. An actual space mission with these robots is still a long way off. But the researchers are looking at other uses for tensegrity robotics as well. For example, they are examining how tensegrity robots could be used in home healthcare. Her lab is also developing educational toys and robots to help teach students about tensegrity and robotics. 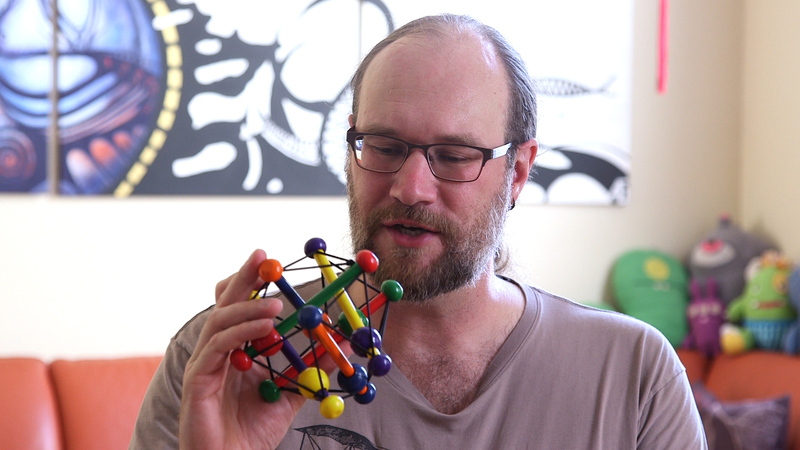 “We’re exploring just the wide range of motions that we can get out of tensegrities. Can they eventually climb up stairs for home health care – that’s one thing that we’re really interested in. So we’re really interested exploring the limit of what you can do with this kind of structure,” explains Alice Agogino. 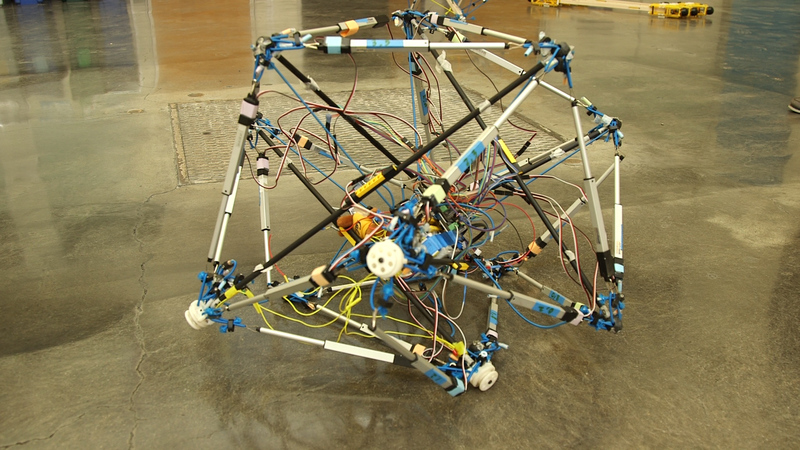 Tensegrity robots could offer exciting new possibilities in the world of robotics. 1. What problems were the engineers trying to solve? 2. What constraints do you think they might be working with? 3. What types of things are they testing when the engineers test their prototypes? 4. What types of changes might the engineers make to their prototypes and designs? 5. How do you think the researchers are using prototypes and computer models to design the robots?